WOW! WOW! WOW! Gorgeous brick home on nearly an acre fenced yard in sought after Unionville area! 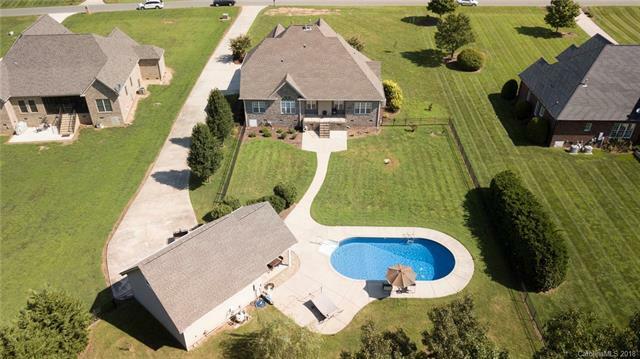 This home features a stunning salt water pool, hot tub hook up and detached garage with covered patio. Get ready to entertain! Inside you will find a large master suite on the main floor with tray ceilings and access to covered back patio, as well as an office on main floor. Upstairs, you will find two additional bedrooms AND a bonus room. This home also touts open concept living, breakfast bar, wood floors, 2-story great room, and fireplace. Additional detached garage has electric and water available. Upgrades include: new flooring upstairs (2017), new carpet in bedrooms (2017), new HVAC upstairs (2018), and new pool liner (2017). Be sure to book your showing today before this one gets away! Offered by Loretta Realty Group. Copyright 2019 Carolina Multiple Listing Services. All rights reserved.